TOKYO -- Japan's automakers aim to electrify at the Tokyo Motor Show with a cavalcade of battery- powered cars that preview the home team's EV ambitions. Connectivity and autonomous driving will also be big themes under the show's banner of "Beyond the Motor." But sticking to tradition, the domestic players won't forget to roll out a few quirky and futuristic concepts to inspire and delight. Foreign brands will keep it low key, with no major debuts. Media days are Oct. 25-26. Public days start Oct. 28. Here's a preview. Honda will debut an all-electric sporty concept car based on the same platform as the compact urban EV unveiled at the Frankfurt show. A teaser photo of the Sports EV Concept shows a rear-slung performance silhouette with rounded rear fenders and a long hood evocative of the now-retired Honda S2000 sporty coupe. 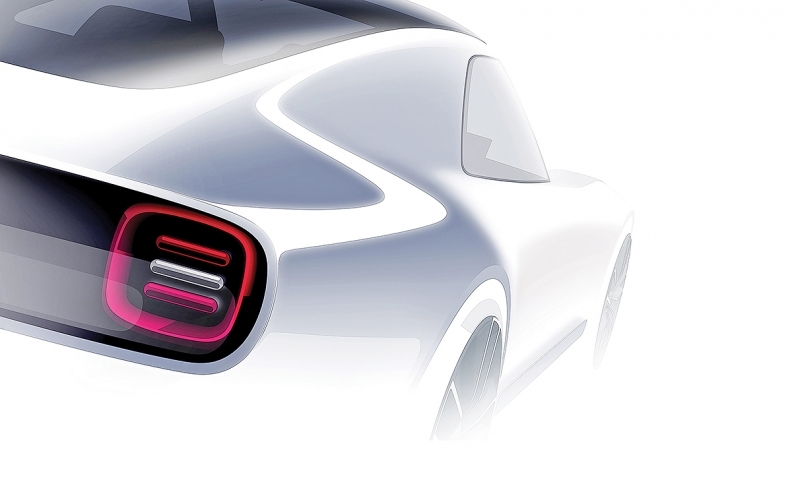 The square taillights get the same treatment as the hatch-styled Urban EV Concept that debuted in Frankfurt. Both cars share the same platform. The Sports EV Concept blends EV performance and artificial intelligence into a compact form. Honda is developing an EV for release in China next year, while the latest concepts preview a separate EV line for Europe and other markets. Lexus is dangling the promise of a new concept car but holding back details. The rumor mill is in high gear, positing everything from a long-awaited three-row RX crossover or more production-ready UX subcompact crossover to a performance LS F variant of the flagship sedan. Another possibility: a luxury fuel cell car. Two concept cars will point toward Mazda's next-generation chassis and drivetrain technology as well as a new design language. The first, a next-generation product concept, deploys the Skyactiv-X engine in what Mazda calls its "ideal hatchback," a compact that may foreshadow the redesigned Mazda3, due around 2018 or 2019. Billed as the world's first commercial gasoline engine to use compression ignition, the Skyactiv-X powertrain will arrive by March 31, 2019. Mazda promises the new engine will boost performance and fuel economy. 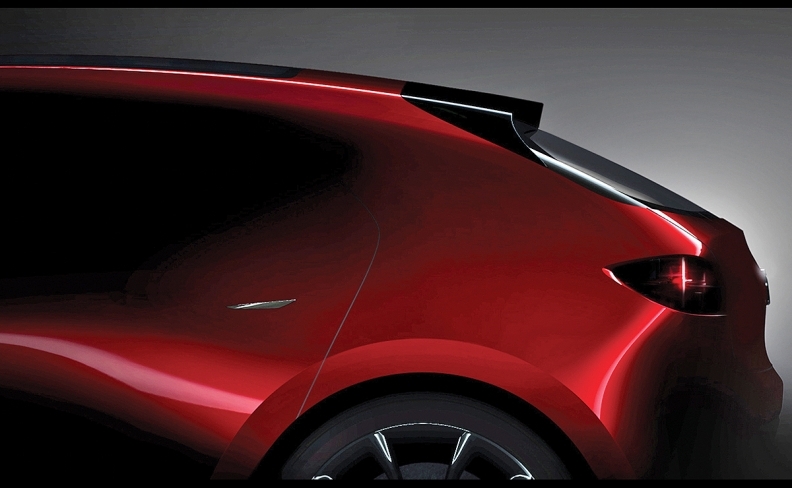 The hatchback concept will also showcase the brand's next-generation vehicle architecture, which Mazda says delivers a more comfortable, responsive ride. The second concept pulls the wraps on a new styling direction that evolves the curvy sensuality of the Kodo design language in play since 2012. Teaser shots show what looks like a coupe-styled sedan with a rear-slung cabin, long hood and short rear deck. Dramatic creasing stretches along the shoulder from the headlamps to the tail. It exudes a more taut, technical look than today's Mazdas. The coupe-like e-Evolution Concept showcases Mitsubishi's vision for a greener, smarter crossover. It blends the Japanese carmaker's four-wheel-drive system and electric powertrain knowhow with artificial intelligence. The name is a nod to the performance heritage of the Lancer Evolution street racer. But the concept gets a three-motor drivetrain, one for the front wheels and two for the back. The wedge-shaped crossover sports a dramatically slanted rear window and a front that slopes from the roof at a long, low angle to the nose with hardly any hood. Up front, a bank of crystal-like lights lend a high-tech feel. The concept's artificial intelligence system reads the road through an array of sensors and seamlessly coordinates the human driver's intentions with the car's self-driving capabilities. The e-Evolution is a showcase of technologies Mitsubishi wants to bring to market starting around 2020. Nissan will tout its electric strategy with a new concept vehicle and a sporty version of its just-unveiled next-generation Leaf electric vehicle. The Nissan Leaf Nismo Concept is a performance take on the flagship EV, with tuner treatment by its Nismo subbrand. Sporty exterior tweaks improve aerodynamics and reduce lift to keep the Nismo Leaf glued to the road. It also gets a sport-tuned suspension, high-performance tires and a custom-tuned computer that delivers "instant acceleration at all speeds." The other concept gives clues about the direction of Nissan's "intelligent mobility" strategy to bundle electrification with autonomous driving and connectivity. Nissan did not offer details, but one possibility is an electrified crossover variant of the Leaf that executives have been hinting at for months. Nissan will expand on the performance theme with a Nismo version of the Serena, a Japan-market family van. That vehicle goes on sale in November. Nissan said in the spring it wants double the number of Nismo nameplates and deliver a sixfold increase in global Nismo sales over the next five years. Subaru's Viziv Performance Concept previews a curvy next-generation look that may feed into redesigns of the Legacy or WRX sedans, both due for overhauls as early as 2019. The car is the latest in a series of Subaru Viziv concepts that take their name from "vision for innovation." The Tokyo offering will combine Subaru's latest safety technology with the fun-to-drive characteristics of a true sport sedan, the Japanese carmaker said. There is no word on its drivetrain, but the Viziv Performance Concept embodies Subaru's vision for next-generation autonomous driving systems built upon the brand's EyeSight safety technology. The sedan sports a short rear deck, muscular fenders and wavy side creasing, while the wheel well arches get protruding lips. Toyota looks to the past and future with updates of two old-school sedans juxtaposed against two visions for radically different hybrids. The first sedan update is a tech-savvy take on the storied Crown, which dates to 1955. Toyota's top-shelf, full-size sedan in Japan gets redesigned from scratch, starting with the company's new modularized global platform. Track-tested at Germany's Nurburgring circuit, the new close-to-production Crown Concept also gets next-generation connectivity and safety technology. Also overhauled is the plush Century, a byword for chauffeured luxury in Japan since its debut in 1967. The long-in-the-tooth limousine is still coasting on its last redesign in 1997. The upgrade brings the long car into the 21st century with a 5.0-liter V-8 engine mounted to Toyota's trademark hybrid system. The exterior largely keeps its elegant simplicity but gets some contemporary flare with a more rear-slung cabin. 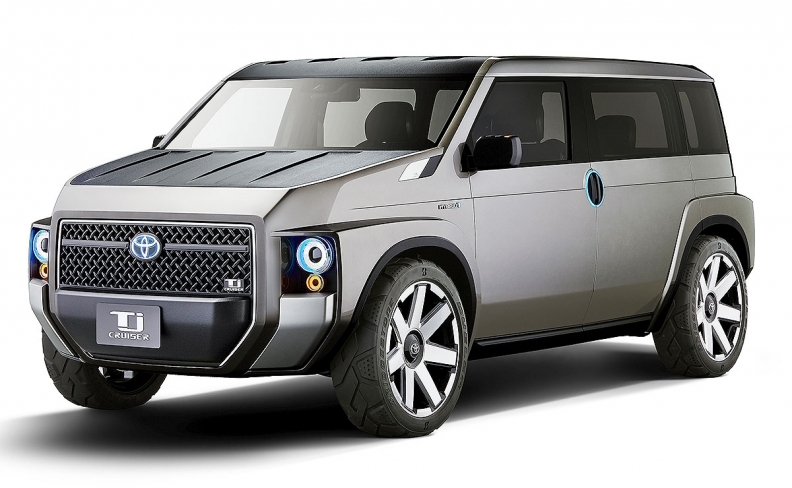 For its other concepts, Toyota says it will explore a new genre with the Tj Cruiser, a monolithic crossover that merges the roominess of a cargo van with the feel of an SUV. The "T" in the name stands for toolbox, apt given the concept's boxy dimensions. Toyota says the "j" stands for the joy that riders get from venturing to different destinations. Toyota envisions the Tj Cruiser as running on a 2.0-liter-class engine mounted to a hybrid system and available in either two- or four-wheel-drive layouts. Toyota will also show its sporty side with the GR HV Sports concept. It draws heavily from the 86 sporty coupe — a version of which is sold by Subaru as the BRZ — with a couple twists. For starters, it gets a vertical array of LED headlamps and a targa top, in homage to such venerable convertible forerunners as the Toyota Sports 800 and the Supra. Powering the matte black car is the Toyota Hybrid System-Racing, the electrified drivetrain technology used in the TS050 racer Toyota enters in Le Mans and the World Endurance Championship. Adding to the fun is the ability to switch back and forth between six-speed manual and automatic transmission modes. The push-button ignition is at the tip of the shifter, like the machine-gun trigger in a James Bond car.